Greetings and welcome to The Blog of Funny Names (in Food), a small village in the BoFN world that you know and love. Today we meet Ms. Crescent Dragonwagon. Living my food-centric life, I knew Dragonwagon as a cookbook author, but only for the BoFN team did I bother to dig deeper. And oh, what a treasure trove I found. Crescent Dragonwagon has authored seven cookbooks, including Passionate Vegetarian, Dairy Hollow House Cookbook, and The Cornbread Gospels. But there’s more, folks: She’s also written over 20 children’s books as well as poetry and novels, bringing her total of published works to over 50. Daughter to well-known authors Charlotte and Maurice Zolotow, she has an impressive writing pedigree. CD is a fantabulously cool name for sure—one I would choose for just about any character were I writing sci fi or fantasy novels. It would also make a pretty cool gaming avatar. But knowing she’s a real person who writes books (rather than appears in them) makes a funny-name fan wonder where she got that crazy name. The answer was easy to find: A quick search led me to the answer in her awesomely titled blog post, “Is that your real name”? I encourage you to read it yourself as Dragonwagon has a way with words (she’s an award-winning author, for gosh sakes), but will recap here. The Dragon(wagon) logo depicts an industrious dragon with excellent posture. A second marriage to Ned Shank was much happier, though ended after 23 years at his death. Dragonwagon and Shank owned the Dairy Hollow House, an inn and restaurant in the Ozark Mountains. They also co-founded the non-profit Writer’s Colony at Dairy Hollow, which continues to thrive. 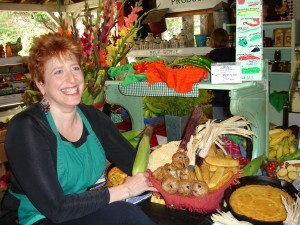 Dragonwagon has since developed and still leads her Fearless Writing workshops, which proudly count Julia Child as alum. In addition to writing cookbooks, she contributes to food publications such as Relish, Bon Appetit, and Fine Cooking. Dragonwagon is an immensely talented and exuberant writer who successfully spun a radical decision of her youth into a strong and defining piece of her character. This warrior has earned her awesome name. This entry was posted in funny names in food, Greatest hits and tagged cookbook author. Bookmark the permalink. This was such a fun read, and your caption of the dragon(wagon) logo made me laugh out loud. Well done!!! I hope that chair is ergonomically appropriate. That dragon looked awfully large by comparison. I’m thinking the chair is probably NOT erg approp, as it doesn’t appear to give any upper back support. ?? And the dragon’s body does indeed seem to swallow it up. Though I don’t know details on dragon vertebrae so… Thanks for dropping in on CD! Can I comment independently on my own post? (Of course I can:-)) Shout out to Dave for the fine welcome. Wow–that’s a lot of nice. I can do Friends–that was fun while it lasted. Which has me thinking, maybe you could spin your blog into a TV Pilot? With the ultimate goal being a movie version? How ’bout you think on that in your free time, when you’re not researching brain science and funny names and such. Monica cleans and I don’t clean. Also, I am not neurotic (says me, others may disagree). Can we make slight personality changes? You seem a good fit for Rachel and I wouldn’t mind Dave for a brother. ?? Haha, this is exactly what I was hoping for when I posted that comment. Arto is totally a Chandler. Haha, I was hoping to get Richard Burke (Tom Selleck) since we have one extra person for each gender. He’s an MD and got to date Monica. Seems like a good life 🙂 Rob and Mark both like sports a lot, so they could be Joeys, but Rob is tall, dark haired and gentle like Ross so he could be Ross too. Mark is an east coast guy who is a big fan of all NY sports teams so maybe he’s Joey – a much smarter version of Joey. Thank heavens we don’t have a Gunther! As for the ladies: that one’s trickier, especially since I haven’t met any of you in person (other than Mailman). However, I do think Amb as Rachel, Liz as Monica, and Fannie as Phoebe seems like a good fit. Mailman (who I just decided to goad to post more) could be Ursula (Phoebe’s twin sister) or maybe Carol (Ross’s ex-wife). She definitely couldn’t be Janice (though I did love Janice’s character). If we’re bringing in secondary characters, perhaps Mailman could be Jill or Amy? Then she’d be related to ME (I’m so excited she’s coming back to post again!) And Pete was fun too, if we need another boy. Man, Monica got all the good boyfriends! … on the other hand, Leslie (Arto’s wife) told me I was most like Ross, so it’s not the first time I’ve heard that. I just hope I’m not as whiny or awkward as Ross. Or such eligible divorce material 🙂 I guess if we allow slight character changes, then I’m willing to accept Ross. He’s not totally insufferable, and we do have some things in common 🙂 But honestly, what man worth his salt wouldn’t want to be Tom Selleck!? Wow–you guys have put a LOT of thought into this 😉 So many direx it could go. No nagging from me, Dave, about china plates or anything else. Remember–am not neurotic. I like good food and good times and along with both come broken plates, etc. Thinking I’m the only female on the planet who is NOT attracted to Tom Selleck (too hairy 0-:), so could I date someone else? (just don’t tell my husband–haha) Will leave the rest of the character assignments up to you all as I don’t know folks so well. Was a huge friends fan at the time though (I read the book, really, I did! AND I have a Friends cookbook–not making this up), so fun to read your comments. Wow Liz, that was worth the wait. Loved it. One a separate note, friends would be very funny. And I could see myself falling into Pheobe’s shoes. Liz-After wandering about your blog, I think you the one with the great taste. Marshmellows! thanks:-) we should all (by all I mean anyone who enjoys BoFN) get together and have a Great Taste Convention. I will bring the marshmallows and cocktails. That sounds like a great idea. Congratulations on being posted on Crescent’s FB page. Yay! um, thank you:-) Glad you liked. When I was in Sacramento one summer, there was someone in the phonebook named Orange Moony. I’m sorry. That’s all I got. Unless you do stage names. The name that came to mind was none other than . . . Caroline Charonplop Kyary Pamyu Pamyu, better known as just Kyary Pamyu Pamyu. For the groundwork on the name a little more digging is needed but not much. She started as a Harajuku denizen, became a fashion blogger, then a model, then a designer, then a pop artist with millions watching her videos, then a (an?) ubiquitous tv presence, including appearances on tv commercials. She has been compared to Lady Gaga but it’s not apt. Gwen Stefani and Katy Perry are more plausible, plus, I think, a whole lot of Lewis Carroll. She’s only about 20. It’s like Twiggy meets Lewis Carroll meets Hello Kitty. you’re awesome to say that–thanks! Though we must make a distinction here 😉 This blog belongs to a gang otherwise known as the Blog of Funny Name Guys. And I am proud to be a part of it for sure, but it is their blog, not mine and I can take credit for only a teeny tiny piece of the pie. You’re welcome to check out my foodforfun blog as well, but the captions will never be as interesting–haha. Seriously, though, thanks for being here. You rock! There’s no way a sentence featuring the word “Doodlebop” could ever be boring. On the topic of words that make you smile, I had a friend today post pictures of herself with baby turtles. I realized that not only are baby turtles possibly the cutest thing I’ve ever seen, but even the term “baby turtle” makes you smile. It’d be interesting to see a study on what kind of effect certain types of sounds have. Arto’s a linguist, maybe he can do it. Wow, what a name! I can’t believe I’d never heard of her before. Certainly would’ve remembered such a fantastic moniker. Nice job Liz and welcome to the fold! This week’s Throwback Thursday post goes back to the beginning of this year when Liz first joined the team. Thus far, Crescent Dragonwagon is the only person profiled by the Blog of Funny Names to reach out to us after reading our post. Liz has a knack for people getting in touch with her for funny names-related business. I have Get in Touch written all over me–haha. Thanks, Dave 🙂 I still remember the thrill of having the post go over so well. And I am happy that you are happy, so the cycle is ON. Immensely flattered to be your “favourite food writer.” Woohoo! Hope you slept well.